​is the second in a series of three inspiring Kontakt 5 instruments, the so called Blue Orb Series. Triode is a dual oscillator synthesizer intended to make fat, analog and digital sounding lead sounds. Triode has a dual oscillator architecture with multiple envelopes, filters, LFO's and effects. But don’t be fooled by it’s name. Also pads, synths, strings and other types of sounds are possible with this versatile synthesizer. ​60 different waveforms to choose from, 30 per oscillator. Each OSC has 3 envelope generators. (Amplifier, Filter and Pitch) and 3 different filters, (LP, HP and BP). There are 2 LFO’s, a Pitch LFO and a Filter LFO with a choice between 4 different waveforms (Sine, Saw, Square & Random), or the LFO can be switched off. Both LFO’s can be used at the same time. ​can be modulated via Velocity, Aftertouch, Key Follow and the Modulation wheel. And to top this all off, you have a choice between 8 different FX (Digital Reverb, Digital Delay, Chorus, Flanger, Phaser, Compressor, 2-Band EQ, Skreamer distortion) and an Arpeggiator with an integrated arp pattern generator. ​ already comes with a big selection of sounds for you to play with (184 instruments and 64 multis) of which 140 are lead sounds. The sounds of Triode are highly inspirational and are therefore very suitable to translate your musical ideas into complete tracks. The big amount of controls encourages you to make your own sounds The possibillities are endless. Be ready to enter the world of Triode. You won't regret it. This library will only work in the full version of Kontakt 5.3 or higher. When using the free Kontakt Player, this library will only work for 15 minutes in demo mode ! Mark Taylor: "INSPIRATIONAL SYNTH SOUNDS!. I've been in this business for a very long time and have used a lot of music tech gear... Triode is one of very few purchases that has instantly inspired me to just go and create some music! The sounds are beautifully produced - warm and punchy. More importantly they are very useable and easy to mesh together in a mix. Don't be put off by the LEAD SYNTH' moniker...there are various styles of sounds included in the presets from sweeping pads to driving arpeggiators and Triode does them all very well indeed. The GUI is easy to use and intuitive to understand...creating your own timbres is quite straightforward and loads of fun! The modulation possibilities are quite varied + easy to tweak and automate. CPU use - very good so far, no issues at all. Compares very favourably with my other synths. Highly recommended!" BEL - INCANDELA JLB - FAB: "RIODE UN SYNTHÉ "LEAD". Rien à de plus, le titre explique tout. Il peut sonner vintage analogue et moderne numérique, il est facile d'utilisation, simple et efficace. Il y a 184 présets lein de réglage, en bref il a tout pour faire des lead, des pads et des sons plus subtils de folie, berf, Un synthé quoi. Utilisez de préference des effets externe (Hardware type lexicon et DBX) pour grossir le son, lui donner un grain, du coup il devient Terrible !! Bravo CL-Project et Merci Kontakt Hub." Keith Chalker: TRIODE. 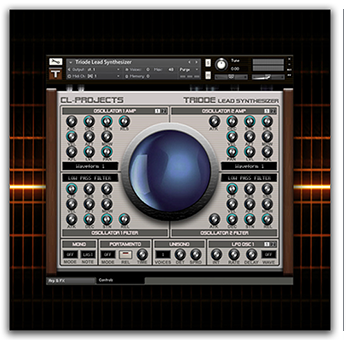 "As with other CL-Projects Kontakt synths this is classy fat and very usable. Top stuff!"